I hope your week is going well~All is good here, just trying to wind down a bit. I was able to get in my craft room and do a little organizing and cleaning. After doing a lot of projects the last few weeks it was such a big mess I couldn't stand it, lol! I manage to get a little done and then took a break to create this fun little treat. I used some awesome product from Jaded Blossom. I love the candy stamps...they really add some fun to your treat! 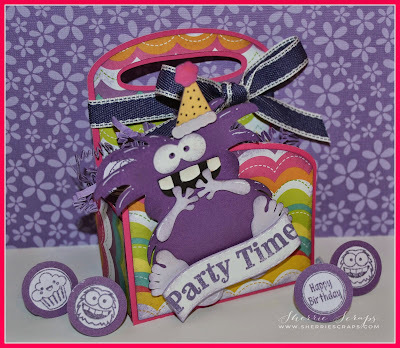 The Arched Caddy Box and the cute Monster are from Svg Cutting Files. The pieces are all distressed lightly with TH Dusty Concord. The sentiment is stamped with Jaded Blossom Supersized Birthday Greetings onto a banner from the Mini Tag Dies 2. I filled the box with yummy chocolates but first I decorated them using Jaded Blossom's Birthday Candies 2 and Monster Candies stamp sets. I finished with a fun bow using stitched ribbon from SU. Wouldn't this be fun as a party favor for little kiddo's at a birthday??? Oh my gosh, this brought the hugest smile to my face!! That is the ca-utest monster!! Heehee...can't quit smiling!! I love the fun papers and the adorable treats, too!! Awesome as always my sweet friend!! Super fun project! The monster is simply adorable! Love the fun colors and papers you used! Awesome treats too! So stinkin cute!!! Love your treat boxes and bags so much and this one is just so awesome! it's my fav color and i just love the candy being decorated too! Love it! My sweet friend, your projects are always completely adorable! I love the candy stamps, too... they add the sweetest touch of whimsy. The arched box is fabulous and I just want to hug the precious monster! I always love seeing what your creative heart has dreamt up, Sherrie. :o) After a very long day, I am so happy to be visiting you! (Still no progress on the BL/Blogger situation! This is crazy!) Have a twinkly night, my friend! Sherrie, your right such a cute fun treat box. Love those candy colours sure to brighten up any party goer. Thanks for linking up with us over at myshericrafts this week. SO cute! 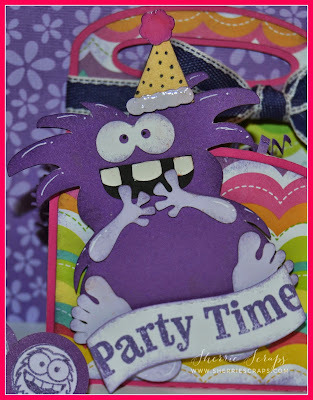 Love that purple monster...his/her? teeth just crack me up. 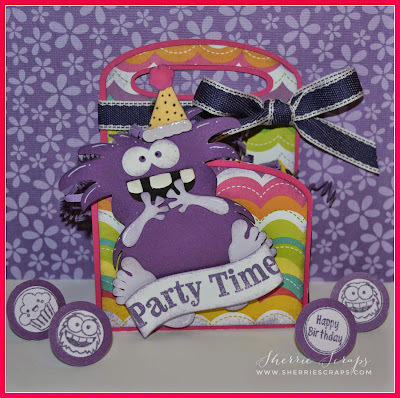 Such a fun little guy and what yummy treat box. PS...when you get your craft space in order, I could use some help in my disaster zone! OMG how fun is this!!!! I love it. Oh how CUTE!!!! LOVE this Happy Cheerful Monster... I can't stop smiling when I look at him!!!! CUTENESS!!! :) Have a great day! 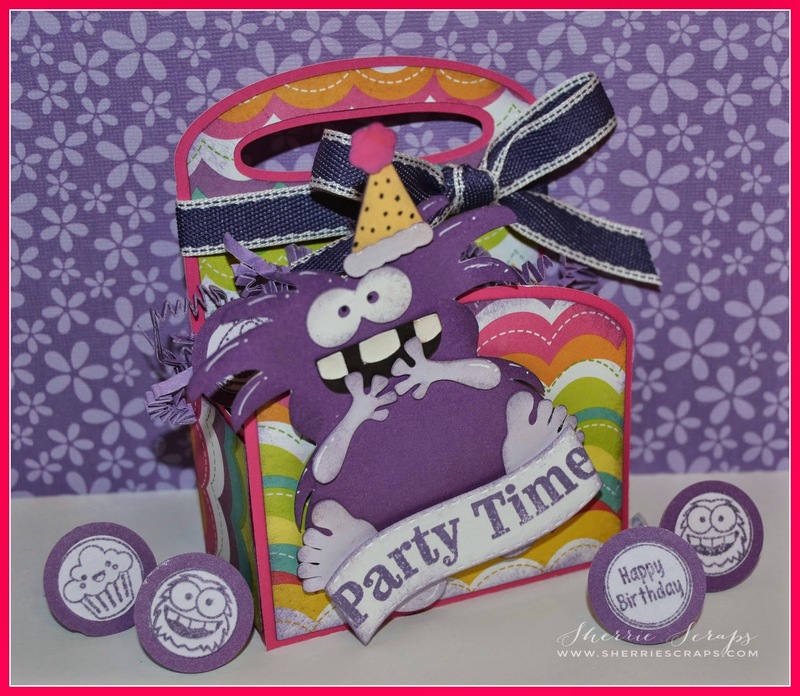 Such a cute treat box and fun purple monster! Thanks for sharing at My Sheri Crafts! Cute, fun, exciting and screams PARTY!! Love the monster, Corbin would love this box. Hehehehe this made me chuckle! I feel like that monster right about now juggling life! HA! ADORABLE all over and I couldn't agree with you more about the craft room mess ~ after awhile I cant take it either! I love that party monster!! TOTALLY cute and fun!! Super fun treat box!! How fun! That little monster is cute as can be and the papers are perfect! Cute, cute, cute! Awesome Creation! Thank You so much for joining Loves Rubber Stamps this week! OMG I just LOVE this!!!!!!! !